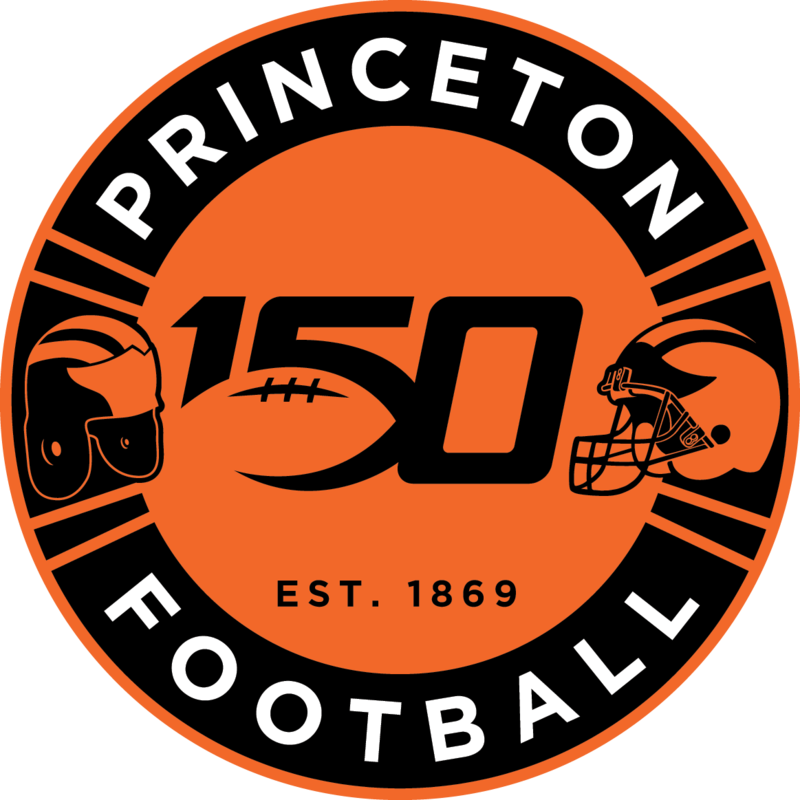 The undefeated Ivy League champion Princeton football team put a league-best 18 players on the All-Ivy League team, including nine on the first team. That total is tied for seventh-most in Ivy League history, and the six first-team All-Ivy offensive players is tied for the most in Ivy League history. Furthermore, Bob Surace claimed the 2018 Ivy League Head Coach of the Year award, his second in the last three seasons. First awarded in 2014 (one year after Princeton won the 2013 Ivy title in record-setting fashion), Surace is the first head coach to claim this honor twice. He was also named a finalist for the STATS FCS Eddie Robinson Award as the FCS Head Coach of the Year; this is the fourth time that Surace has been a finalist for this honor in the last seven years. Graham Adomitis, George Attea, Jesper Horsted, John Lovett, Rely Radosevich and Charlie Volker were all first-team All-Ivy League honorees from the record-setting Princeton offense, while TJ Floyd, Mark Fossati and Tom Johnson were first-team honorees from a defense that ranked fourth in scoring, seventh in rushing and 11th in total defense at the FCS level. Tiger Bech, Stephen Carlson, Ben Ellis, Delan Stallworth, Jeremiah Tyler and Mike Wagner each earned second-team All-Ivy League honors, while Joey DeMarco, Alex Deters and Collin Eaddy achieved All-Ivy League honorable mention. The finalists for the Bushnell Cup will be announced at a later date. The lone unanimous first-team selection for Princeton was senior captain John Lovett, who ranked second in the Ivy League in both rushing (99.3 yards/game) and passing (203.7 yards/game), and third in scoring (8.7 points/game). A three-time Ivy League Player of the Week, he ranked fourth in points responsible for per game (20.9) at the FCS level. He capped his career with an Ivy League record for consecutive games with a rushing touchdown (20) in Princeton’s perfect season-clinching 42-14 win over Penn. Somehow Jesper Horsted was not a unanimous first-team selection despite leading the Ivy League in touchdowns (15) and ranking seventh nationally in the FCS with 7.2 receptions per game. Both he and fellow first-team honoree Reed Klubnik (Yale) had more than 70 catches and 1,000 receiving yards, while no other Ivy player had more than 55 catches or 840 receiving yards. Horsted ended his career in style, catching three touchdown passes and running in a fourth to earn FCS National Offensive Player of the Week honors. Charlie Volker is the only player in the Ivy League to rank above Horsted and Lovett in scoring; he finished with 14 rushing touchdowns in only nine games, and he averaged 75.0 yards per game during the championship season. In his nine starts, Volker had more games with multiple touchdowns (five) than games without (four), a stretch that included a three-touchdown game at Cornell. Three of the guys who led the way for the Ivy League’s top-ranked rushing offense were offensive linemen George Attea and Reily Radosevich, as well as tight end Graham Adomitis. That trio helped Princeton average 295.5 rushing yards per game and score 40 rushing touchdowns; to put that in perspective, six of the eight Ivy League teams didn’t score a total of 40 touchdowns combined. Princeton rushed for 286.3 yards in Ivy League games, which is the eighth most in Ivy history and the most since 1991 (Yale, 297.9). It was fitting that the linebacking duo of Mark Fossati and Tom Johnson earned first-team honors together, because it made up one of the best defensive duos in Princeton history. Despite not playing significant snaps in the second half of several blowouts, Johnson (68) and Fossati (66) still ranked 11thand 13th in the Ivy League in tackles. 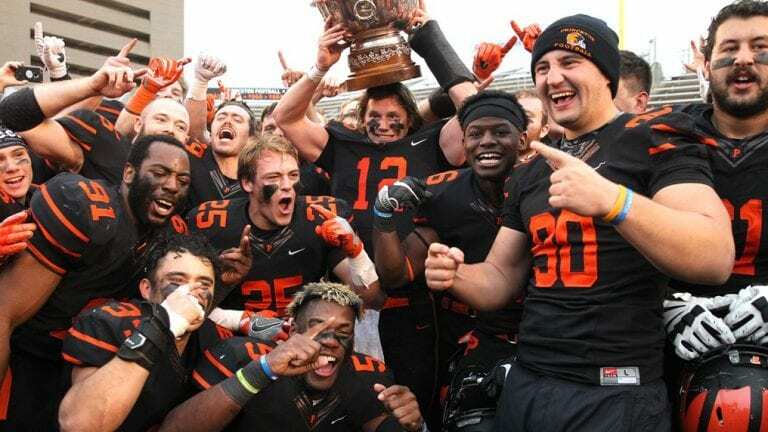 Together, they helped Princeton put together a defense that ranked fourth in the nation in scoring defense, seventh in rushing defense, and 11th in total defense. Fossati was a two-time Ivy League Defensive Player of the Week, including one after a game-clinching interception against Yale, while Johnson capped his career with 10 tackles and a sack in the finale over Penn. Floyd thrived in his second year as a starting safety, and he finished second in the Ivy League with six interceptions on the season. He had two interceptions apiece in Ivy wins over Cornell and Columbia, though his biggest pick came in the end zone of a tight 29-21 win at Harvard. Floyd added 33 tackles and a pass breakup during the season. Tiger Bech was a feared punt returner in Ivy play, and he averaged 10.8 yards on 18 returns, including a 39-yarder in the win at Harvard, where he helped turn field position for Princeton multiple times. Bech added 10 catches, including a 70-yard touchdown reception against Lehigh. Stephen Carlson paired with Horsted to put together the best 1-2 receiving punch in the league over the last two seasons. He had 51 catches for 683 yards and five touchdowns on the season, including two in a nationally televised win over Columbia, and he finished fourth in the Ivy League in both categories. Ben Ellis was the leader of the back line of Princeton’s defense, and he was especially dominant in the run game. He finished fourth on the team with 51 tackles, including four for loss, and he recorded an interception in his final collegiate game, a 42-14 win over Penn. He was at his best in the biggest games, and none was bigger than a nine-tackle effort during the win over Dartmouth. Delan Stallworth made the most out of his first year as the fulltime starting cornerback, and he proved equally strong in the run and pass game. He ended the year third on Princeton in tackles (56), and his lone sack came in the second half of the win at Harvard. He added three pass breakups, though he faced fewer opportunities as the season progressed while teams kept throwing to other areas of the field. Jeremiah Tyler moved to the strongside linebacker position — one that isn’t always conducive to stats — and created havoc for opposing offenses. He finished the year with 29 tackles, including five for loss, and two interceptions. Two of his biggest plays helped set the stage for the bonfire; he had a tackle for loss on a fourth down late in the win at Harvard, and he had an early interception that set up Collin Eaddy’s second touchdown of the opening minute in a win at Yale. Mike Wagner was the NCAA leader in sacks before a season-ending injury last season, and he didn’t waste time having a similar impact as a senior. He led Princeton in both tackles for loss (7.0) and sacks (5.5), and he had one of the biggest defensive plays of the season, a third-down sack in the final minutes of the 14-9 comeback win over Dartmouth. Joey DeMarco was one of Princeton’s top defensive linemen on the season; he had 30 tackles and 2.5 sacks on the season while playing in a deep rotation, most of which will return for the 2019 season. Alex Deters moved into one of the three open starting spots on the offensive line, and he handed all the responsibilities at the center position while also helping block for the top rushing attack in the Ivy League. Collin Eaddy finished eighth in the Ivy League with 66.3 rushing yards per game, but he made the most of his lone start following an injury to Charlie Volker. He had 266 rushing yards and three touchdowns at Yale to earn Ivy League Player of the Week honors.